In 1939, Jean Drouant and Henri Soulé, a maître d'hotel, were selected by France to run a restaurant at the French Pavillion at the World's Fair to be held in New York that year. At age 18, Pierre was chosen to be premier commis poissonnier (first assistant fish chef) and joined an impressive team of cooks. As World War II erupted, the restaurant ceased operations sending Pierre back to France to face induction into the French army. However, six months later, the Fair reopened and Pierre was asked to return to the Pavillion as premier commis saucier (first assistant sauce chef). After the Fair ceased operations in 1940, Henri Soulé decided to remain in New York to open the restaurant "Le Pavillon" in Manhattan with Pierre as his chef poissonnier (fish chef). 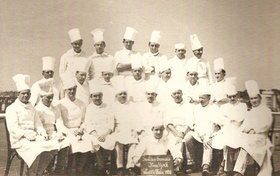 While waiting for the restaurant's grand opening in 1941, Pierre briefly worked in the banquet and room-service kitchen at the Waldorf-Astoria. In 1942, as America entered the war, Pierre joined the US Army, only to be summoned to the Pentagon to become personal chef to General Douglas MacArthur. However, Pierre rejected the cushy post; he told his superiors that his place was beside his countrymen on European battlefields, fighting to defeat the Nazis. The young soldier was then dispatched to boot camp in Fort McClellan, Alabama where he flunked out of cooking and baking school for refusing to sharpen knives and peel potatoes the GI way." He eventually joined the infantry serving in France, Germany and England, and was awarded The Purple Heart as a sergeant. 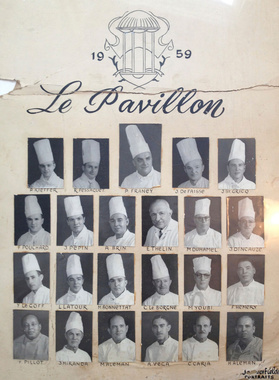 When the war came to a close, Pierre returned to the Le Pavillon restaurant to become Executive Chef in 1952. He also opened and served as Executive Chef at Henri Soulés celebrated La Côte Basque in Manhattan and at The Hedges Inn, a fashionable summer eatery in East Hampton, NY. During this period Le Pavillon became recognized as a world-class restaurant -- employing 30 people in its kitchen, and serving lunch and dinner to upwards of 150 guests. Henri Soulé ran an impeccable dining room gaining legendary status by featuring classic French cooking with truffles, fish and fresh langoustes imported daily from France. Americans were introduced to haute cuisine chosen from a menu written in French as they drank champagne and Chateau Pétrus in Baccarat glasses. Henri Soulé presided over the dining room with breathtaking precision: jackets and ties were mandatory for men while women were turned away for showing up in pants. Statesmen, royalty, CEOs, and the powerful all competed for select tables in the front of the house. One captain was assigned to three or four tables, assisted by two waiters -- one who hovered close by to cater to the diners whims and the other to run the food to and from the kitchen. Despite being the owner, Henri Soulé never entered the kitchen during dinner service, respecting the galley as the domain of the chef  a move crucial to Soulés success. However, Pierre left Le Pavillon in 1960 after a bitter dispute with Henri Soulé over wages and hours for the staff, the majority of whom resigned in a mass walkout. Soon Soulé was forced to close Le Pavillon, causing front page headlines to appear in The New York Times. As a result, Pierre began his professional relationship with Craig Claiborne, the Times food editor and restaurant reviewer who had reported the original split with Soulé in a piece entitled Le Pavillon Shut in a Gallic Pique."